By 1965, Banks was indisputably the first-choice England goalkeeper. He was settling into the form of his life which would last for the next seven years; agile and alert, he was frequently seen making amazing reflex saves and possessed flawless positional sense and reading of attackers' movements and instincts. When the World Cup began, Banks was in goal as England got through their group containing Uruguay, Mexico and France, drawing 0–0 with the former and clinching 2–0 victories over the latter. Banks was not greatly tested, but it was hugely encouraging that he emerged from the group with three clean sheets from three games, a trend that continued when England beat a physical Argentina side 1–0 in the last eight, with Geoff Hurst scoring with a header. Bobby Charlton scored twice in the semi final against Portugal before a late penalty was conceded by Jack Charlton handling the ball. 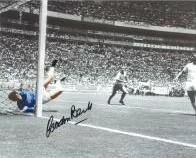 Banks was finally beaten after 43 minutes when Eusébio put away the spot kick to his right. That said, England had won 2–1 and were in the final, where West Germany awaited. It was England who dominated the final but it was Banks who was beaten first. A weak header from Ray Wilson handed a chance to Helmut Haller whose shot was not fierce but was on target and needed dealing with. Banks thought Jack Charlton was going to clear; Charlton in turn thought Banks had it covered. Neither went for it as a result, and the ball crept in the corner. England equalised through a Geoff Hurst header within six minutes and went ahead late in the second half through Martin Peters.